CopyTo is a new generation tool to backup all your music and data files. It contains several methods to build your CDs ,DVDs or Blu-rays, such as integration to shell, user friendly frontend or FileDepot technology. 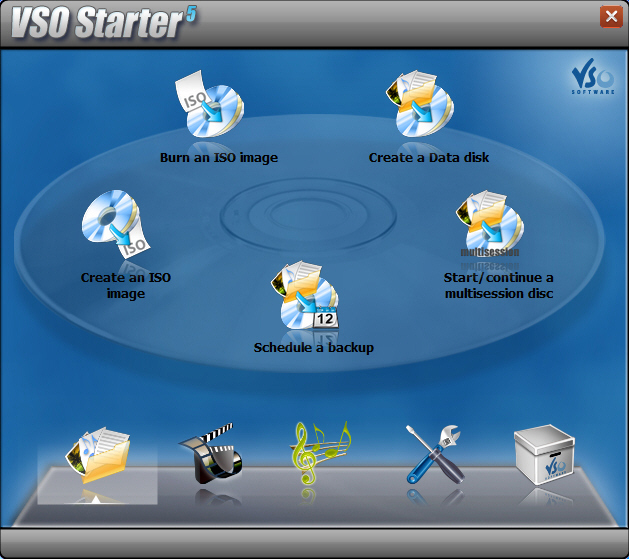 With a few clicks you can burn files, folders, pictures, and music (MP3/Ogg Vorbis/WMA) to CD/DVD/Blu-ray. It uses a smart data analyzer which suggest the best output format (audio CD, MP3 disk, DVD Video, Blu-ray disk). 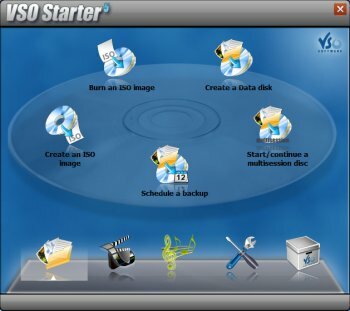 Create ISO files and Multisession disks. Designed for beginners, CopyTo also has all the advanced features and settings advanced users may want just a click away. to many freewares do the same thing. Not saying the products bad but I personally would not buy it . I gave this 5 start because i tried many burning programs in my laptop, and so many failed (they burned coasters), but this one has succeeded to burn every time working CD / DVD. I use very cheap bulk media,which can be the cause that some programs fail (Roxio Creator 2009, Complex Evolution, Easy Cd-Da Extractor). But this program does what it promises and it is very light on resources and extremely reliable. Also the program is so easy to use that there is no learning curve. This has to be the quickest, easiest, most versatile burning program. I can't imagine any program being more hassle free. My favorite features is the right click context menu, and the 1 click image burning. It's a bit expensive, but if you are careful, you can find good discounts. This appears to be a good burning program with a couple of very nice features, however I just cannot justify the $35 price difference over CDBurnerXP or ImgBurn. To make matters worse, VSO's upgrade policy is free updates/upgrades for one year. Were you using a crack? The software might check your key against a blacklist, or, if a checksum of the executable fails, deliberately write coasters. The fact that they pass verification makes me even more suspicious. My apologies if this is not the case. I must apologise for my previous review. CopyToDVD always worked fine for me but both this version and the last version I reviewed seemed to write data, and even verified (! ), but the data written contains no information (video files seek wihout a timecode, like a 'fake' media file, and cannot be repaired with header-repairers like 'MPEG-corrector'). I'm sorry to say I've never had such a data-unsafe burning program as the last 2 versions of CopyToDVD. If you try this program, check your burnt files execute OK, don't just verify/copy! Right-click DVD burning is something you'll wish you discovered ages ago, I use it all the time now! I must protest at the review which claimed you need to renew subscription annually. I bought copytodvd over 2 years ago, before version 4, and when v4 came along VSO just emailed me an updated serial number (no charge), which has worked for every version since. Give the trial a go! Simply the best program for burning. Simply the best. Light, compact, and just the right features. Very convenient 1-click context menu data and music burning. Also 1 click ISO burning. I'm always amazed by clicking an ISO image, and simply walking away. When I return, the disk is burned and the program has closed itself. No layers of menus to navigate is priceless. It also has good media copying using BlindWrite. The only downside is that it does not copy encrypted media. Oh well, that's a specialty in itself. this is absolutely the best program for burning. dont let the screenshot fool you, the best feature of this program is the awesome right click burning, nothing beats it. try it for ourself. Why oh why buy this when you can buy Clone DVD or other programs that won't expire in one year? Sorry but VSO Software's policy of having to buy their programs every year to continue to receive updates regardless if its a new version or not really rubs me the wrong way. VSO will tell you that if you do not choose to renew your license every year that you can still use the original program version for as long as you wish. In my experience this is not true. I have bought both BlindWrite and PhotoDVD from VSO in the past and burned the original downloads and license key emails to CD. I recently tried to reinstall these programs because i got a new computer and got a "Expired License Key" message for both programs. So if you choose to buy software from this company do so at your own risk. I will probably get flamed for this review of VSO but I'm just trying to warn other users they are throwing their good money away unless they are willing to pay an annual fee to continue to use VSO programs. a nice application here . Excellent, as always from VSO. A good companion to their [formerly freeware] DivXToDVD. Latter converts several video format files to DVD-ready burning structure, NOT just DivX. Link at homepage can still get you the freeware version of DivXToDVD.